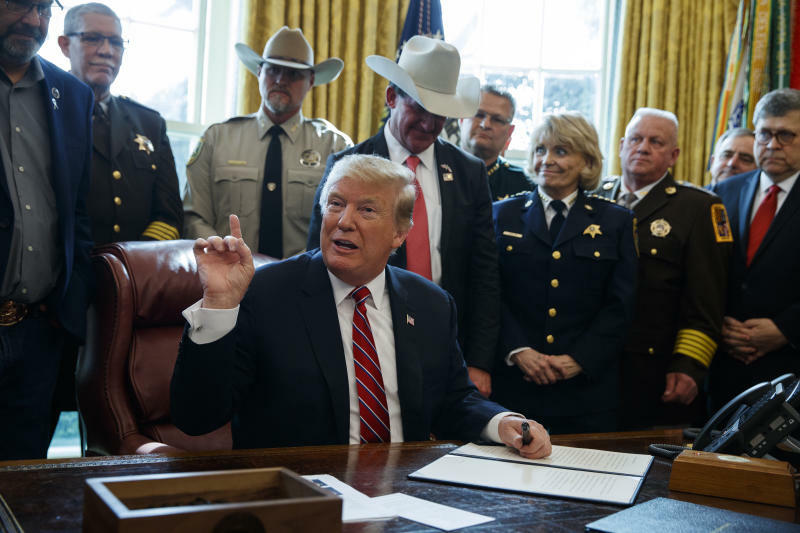 WASHINGTON (AP) -- President Donald Trump appears to be oblivious to the threat of white nationalism. Following a deadly mosque shooting in New Zealand, he said white supremacy isn't a rising danger. But data — including from his own Justice Department — point to rising hate group activity while he's been in office. Trump also asserts the U.S. is No. 1 in the world on the environment and suggests that Toyota's announcement of U.S. job creation is due to his revised trade agreement with leaders from Mexico and Canada. Both claims are problematic. According to several studies, the U.S. lags several countries on air quality. And Trump's proposed United States-Mexico-Canada Agreement has yet to take effect and faces uncertain prospects in Congress. The misstatements came in a week of distorted truth on several fronts. On one, Beto O'Rourke opened his Democratic presidential campaign with a call to action on global warming that misrepresented the science. TRUMP, when asked if he views white nationalism as a rising threat worldwide: "I don't really. I think it's a small group of people that have very, very serious problems. I guess if you look at what happened in New Zealand, perhaps that's the case. I don't know enough about it yet. They're just learning about the person and the people involved. But it's certainly a terrible thing." — remarks Friday in Oval Office. According to data released this month by the New York-based Anti-Defamation League, for instance, white supremacist propaganda efforts nearly tripled last year from 2017. Reports of the propaganda — which can include fliers, stickers, banners and posters that promote hateful ideology — rose 182 percent to 1,187 cases. That's up from the 421 reported in 2017. The Anti-Defamation League in January said domestic extremists killed at least 50 people in the U.S. in 2018, up from 37 in 2017, and noted that "white supremacists were responsible for the great majority of the killings, which is typically the case." The center said it was the fourth straight year of hate group growth, representing a 30 percent increase roughly coinciding with Trump's campaign and presidency. That came following three straight years of decline near the end of the Obama administration. And the Justice Department reported in November that hate crimes across the U.S. spiked 17 percent in 2017 — marking a rise for the third straight year. There were 7,175 reported hate crimes that year, up from 6,121 in 2016, according to the FBI report. More than half of the crimes were motivated by bias against a person's race or ethnicity. Anti-Semitic hate crimes increased 37 percent. Among the episodes in the last few years: a white nationalist rally in Charlottesville, Virginia, in 2017 after which Trump blamed "both sides" for violence, and last October's shooting at the Tree of Life Synagogue in Pittsburgh in which the gunman accused of killing 11 people allegedly drew inspiration from white nationalism. Authorities last month arrested a Coast Guard lieutenant, an alleged white supremacist who appeared interested in attacking top Democrats and network TV journalists. TRUMP: "How is the Paris Environmental Accord working out for France? After 18 weeks of rioting by the Yellow Vest Protesters, I guess not so well! In the meantime, the United States has gone to the top of all lists on the Environment." — tweet Saturday. For example, the Health Effects Institute's state of global air report found 65 countries with less smog when adjusted for season and population. Those include Sweden, Switzerland, France, Germany, Norway, Canada and Venezuela. And in the more dangerous small particles, eight countries bested the U.S. Among them were Finland, Sweden and Norway. As well, Yale's performance index ranks the United States 10th in overall air quality behind Australia, Canada, Denmark, Finland, New Zealand and others. But when it comes to dangerous soot exposure levels, the United States ranked 87th, just worse than the Philippines. On water quality, the Yale index placed the U.S. at 29th and gives the U.S. an overall environmental performance ranking of 27th in the world. TRUMP: "'Last in his class' (Annapolis) John McCain." — tweet Sunday. THE FACTS: He's wrong that the late Republican Sen. John McCain of Arizona graduated last in his class at the U.S. Naval Academy in Annapolis, Maryland. TRUMP: "Congratulations @Toyota! BIG NEWS for U.S. Auto Workers! The USMCA is already fixing the broken NAFTA deal." — tweet Thursday. THE FACTS: Trump suggests that Toyota's announcement that it would create hundreds more U.S. jobs is the result of his United States-Mexico-Canada Agreement. That's a lot of credit to give a trade pact that doesn't yet exist. Trump's tweet links to a Toyota press release in which the automaker said it would invest nearly $13 billion in its U.S. operations by 2021, adding new jobs at U.S. manufacturing plants. Trump did sign a draft of a revised trade agreement with leaders from Mexico and Canada in November. It is intended to replace the North American Free Trade Agreement. But the tentative agreement's fate in Congress, which must approve the deal, remains uncertain. For instance, some Democrats, who now control the House, have voiced concerns that the deal could force Americans to pay more for prescription drugs, which has dimmed the outlook for one of the president's signature causes. BETO O'ROURKE, on global warming: "This is our final chance. The scientists are absolutely unanimous on this. That we have no more than 12 years to take incredibly bold action on this crisis." — remarks in Keokuk, Iowa, on Thursday. TRUMP, on the sentencing of his former campaign chief, Paul Manafort, to a second federal prison term: "I can only tell you one thing: Again that was proven today, no collusion." — remarks Wednesday to reporters at the White House. THE FACTS: There was no such proof in that trial or in Manafort's other trial. The question of collusion was not a part of the charges against Manafort. It's one of the central issues in Mueller's separate and continuing investigation, which is believed to be winding down soon. On Wednesday, Judge Amy Berman Jackson sentenced Manafort for misleading the government about his foreign lobbying work and for encouraging witnesses to lie on his behalf. Again, the case did not turn on his leadership of Trump's campaign. "The investigation is still ongoing," she noted, scolding Manafort's lawyers for bringing up the "no collusion" refrain during the trial. TRUMP, asserting political bias in the FBI based on testimony by former FBI lawyer Lisa Page: "Comey testified (under oath) that it was a 'unanimous' decision on Crooked Hillary. Lisa Page transcripts show he LIED." — tweet Wednesday. TRANSPORTATION SECRETARY ELAINE CHAO, on positive train control: "Nothing happened on this until we came into office. And I would like some credit for that." — remarks to reporters on March 11. THE FACTS: Her comment is inaccurate that "nothing" was done on positive train control before she took control of the Transportation Department. As of December, the braking technology was in use on 30 percent of the miles for which it is required for passenger railroad travel, up from 24 percent at the end of the Obama administration, according to federal statistics. It's in use on 83 percent of the required miles for freight railroads, up from 16 percent in the same period.